Sun Jan 20, 2019 1447 words. Throughout this lesson, you will see the 👉 emoji. Dart will always be on the left, and JS on the right. These are not always perfect 1-to-1 comparisons, but you get the idea. Dart is a strongly-typed compiled language, while JS is a weakly-typed scripting language. Despite being polar opposites in these ways, they share many of the same convetions, so most JS devs will be productive on day one. Want to write some Dart code right now? Head over to the DartPad playground. In JS, you have several ways to import/export values, so let’s just look at the modern ES6 way. When you import a file in Dart, you will have access to everything declared that file. It looks trivial here, but it eliminates the import hell 😠 that you find in basically every big JS project. JS doesn’t have a required entry point to start executing our code, but it’s common to export a function. In dart, a main function is required. Dart has a Map class used to represent key-value pairs. It combines some of the features from in the JS Object & Map. A Dart List is similar to a JS Array, containing most of the same instance and class methods (and beyond). Functions in Dart should feel very familiar to the JS dev - it supports named, anonymous, arrow, and higher-order functions. The main difference is that you don’t need the function keyword. You will be using Classes frequently in Dart and they are very powerful. The language supports mixin-based inheritance, which provides excellent code reuse with composition. In JS, classes are just syntatic sugar for functions and prototypal inheritance. Defining and instantiating a class is nearly identical, but Dart does not require the new keyword. In Dart, you can construct a class by calling its name like a Function. In addition, you can use named constructors to instantiate the same with different logic. Starting any variable or property with _ in Dart will make it private to its library or class. A Dart Future is almost identical to a JS Promise, which is really nice because this is one of the more complex concepts master. A Stream is like a Future that emits multiple values over time and we can even use it with async/await 😍. There is one big concept to keep in mind, single subscription streams (default) will throw an error if multiple subscribers try to listen. Even though streams are available in Dart, I often find myself using RxDart in Flutter. The beauty of RxDart is that it builds on top of streams, rather than try to reinvent the wheel, so anything that uses a stream in Flutter can also use an Rx observable. Also, if you’re coming from the Angular world you can keep the operators you know and love like switchMap, takeUntil, scan, and so on. Overall, it is not very opinionated about how architect the app. You can use composition to build a bunch of tiny widgets in their own files, or create a few big widgets in a single file. Dependencies are registered in the pubspec.yaml and should auto-update on save. As you may have guessed, , which can be called when state changes. Let’s go ahead and recreate this styled component from the react native docs. 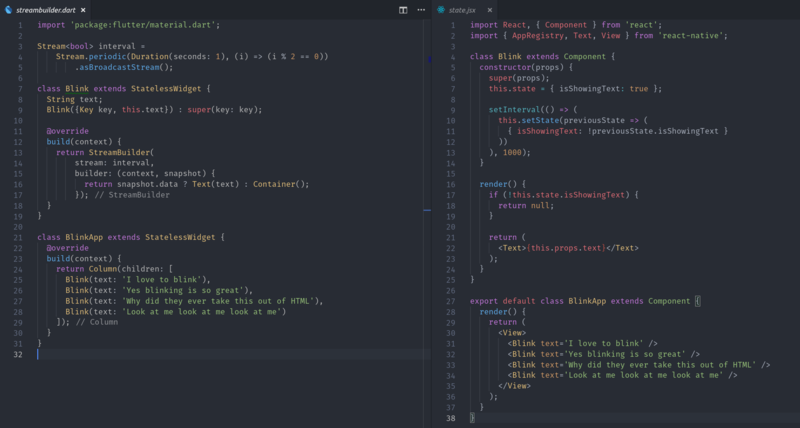 You’ll notice the Flutter version on the left has about 65% of the code footprint, with a guarantee of type-safety. Also see the other examples in this gist. Flutter provides several ways to manage component state. You can use setState just like React does, but there are some additional built-in techniques. My personal favorite is to represent stateful data as a Stream or Rx Observable, then use the StreamBuilder widget to conditionally paint the UI. As you can see, this does not require any explicit calls to render the UI, rather it’s based on the most recent value emitted from the stream. The code footprint is improved slightly, but this gains really add up if you find yourself setting the state frequently.